Facial rejuvenation treatments soften the expression lines define facial contours and involve careful use of injectable fillers and wrinkle relaxation injections. Our experts at DS Dental offer facial aesthetic treatments to enhance your natural beauty and give you more youthful and radiant look. You could achieve a more youthful appearance with a choice of treatments carried out by our fully trained, professional and qualified teams. Wrinkle relaxation injection: Experts at DS dental improve the appearance of both severe and moderate frown lines between crow’s feet and the brow line in adults. We use wrinkle relaxing injections to relax certain muscles, making the skin smooth and allowing creases to diminish gradually. 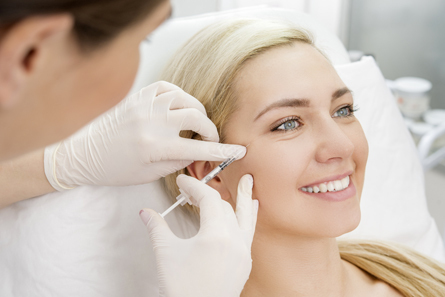 Dermal fillers: Dermal fillers are used to plump out the facial lines, increase volume and dehydrate the skin. Fillers are particularly used to soften the lines around the mouth, chin and enhance the shape and volume of the lips. Peels: Facial peels effectively treat the signs of aging, damage caused by UV rays and discoloration. Our experts apply active solution to the skin surface that peel off the superficial layers exposing a new layer of healthy and undamaged skin. Before deciding any of these treatments, it is important to discuss about your requirements with the dental practitioner.. You will be given advice on your individual concern and estimated cost involved. Book your free consultation to discuss about treatments and prices for facial aesthetics! All our registered nurse prescribers, have undergone extensive training to qualify them to prescribe the right treatment and products for you. At DS Dental, we provide customised treatment and the products that are right for you.